In a medium saucepan, pour in the whole milk, add the corn kernels, cob chunks and salt. Turn the flame to medium and heat the corn and milk mixture until hot to the touch, about 1 minute. Immediately turn off the heat and cover the pan. Allow the mixture to steep for 1 hour. At the 1-hour mark, remove the cobs and discard. Using a hand immersion blender, pulse the milk and corn kernels together until smooth. Alternatively, you could transfer the milk and corn kernel mixture to a blender and pulse until smooth. Place a sieve atop the saucepan and pour the mixture through, discarding the corn pulp (this is great to add to compost!). In a medium mixing bowl, beat the egg yolks and sugar until the mixture turns a pale yellow and looks very smooth, about 1 minute. Next you’re going to temper the egg yolks. Whisking the entire time, add about 1/4 cup of warm milk to the egg yolks. Add the remainder of the milk to the egg yolk mixture and whisk. Return the entire mixture back to the saucepan and place over medium-low heat. Cook the milk and yolk mixture, stirring constantly, until the thermometer reads 170 to 175 degrees F; the mixture should appear thick and coat the back of the spoon. Pour the custard through the sieve into the bowl. Stir in the heavy cream. Keep mixing until the mixture is room temperature. Wrap the bowl in plastic and transfer it to the fridge for 4-5 hours, or overnight, until very cold. 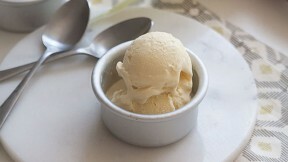 Churn the mixture into the bowl of your ice cream maker, according to your ice cream maker’s instructions. Serve immediately for soft serve or alternatively transfer to a freezer-safe container and freeze overnight. The amount of corn you’ll need for this recipe will depend on how sweet and flavorful the corn you get from the market is. Give a kernel a taste, if it’s really milky and sweet, you should only need one corn on the cob for this recipe. If it’s mild in flavor, add one cob for good measure!